Winter is a tough time for my skin, with it generally getting red and angry as soon as the central heating starts to become a daily necessity. My memories of dealing with its various revolts around this time of year aren’t exactly cheery. When I worked as a PA in the City, I used to get the tube to work while it was still dark, and by the time I got to the office, I’d look in the mirror and see that my foundation had collected in patches of my face that simply remained red and angry-looking from December to March without fail. At school, I remember acne combined with sore, dry spots (so grim and all but impossible to conceal), and two years ago I had such bad dryness around my eyes that my moderate wrinkles looked like deep valleys. 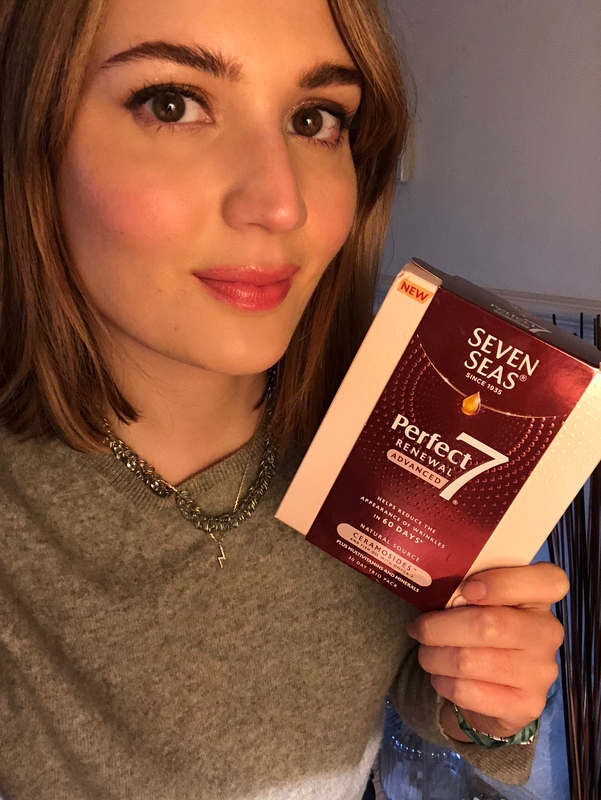 I was therefore extremely game when Seven Seas approached me to give their Perfect7 Renewal packs a whirl for 60 days over winter to see if they’d help my skin out. In the packet are three capsules that you take daily. The first is an Omega-3 with DHA, the second a multivitamin & mineral tablet, and the third a ‘ceramosides’ capsule, which is a natural source of ceramides – aka the stuff that keeps the outermost layer of lipids on your skin strong and sturdy. Jointly, I hoped the three would give my skin a hand when fending off the dual aggressors of dry, hot air in the house and bracing, icy wind while outside walking Monty. I started taking them in November, popping all three daily with my breakfast. It is hard to quantify precisely how well any one nutritional element is working, but I have now noticed that my dry patches are far fewer than they’d usually be around now, and also less intense. They’ve been an especially excellent addition for my face, where I now only have one slightly dry part where there’d usually be at least five, making me feel a bit more confident in my skin (surely I can’t be the only one who finds patchy skin has a huge effect on how I feel about the way I look?). It’s also worth noting that while my skin is where I’ve seen a noticeable effect, that the rest of my body will of course also be benefitting from the added goodness, and that overall health is always going to be improved with good nutrition and considered supplements. This post has been sponsored by Seven Seas.